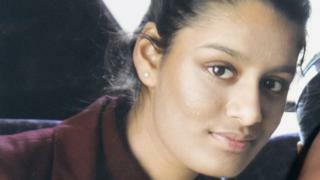 Shamima Begum, one of three teenage girls to flee east London for a new life with the Islamic State group, says she has given birth to a baby boy. Ms Begum left four years ago aged 15. Found in a Syrian refugee camp last week, she now hopes to return home. Under international law, the UK is obliged to let a Briton without the claim to another nationality back in. Asked if she had made a mistake by travelling to Syria, Ms Begum told Sky News: “In a way, yes, but I don’t regret it because it’s changed me as a person. She continued: “I had my kids, I did have a good time there. What can the UK do about the IS teenager? But he added that following the reported death of Ms Begum’s other two children in Syria, they were “very concerned” about the baby and wanted them to come back. 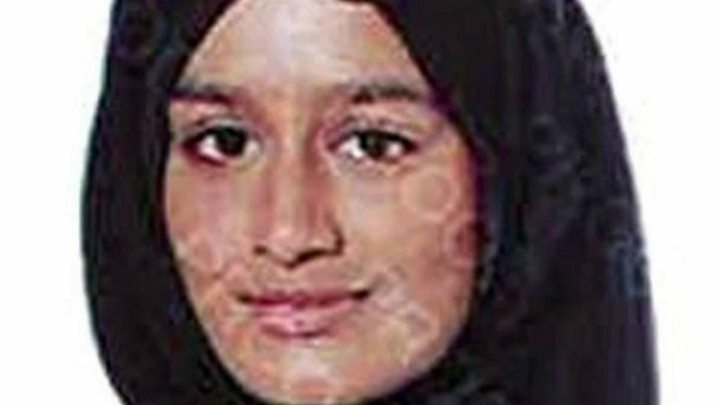 Ms Begum and two other schoolgirls, Kadiza Sultana and Amira Abase, left Bethnal Green in east London in February 2015. Kadiza is thought to have died when a house was blown up, and the fate of Almira is unknown. Ms Begum was first tracked down by The Times. In an interview published on 13 February, she said she was heavily pregnant and had lost two children. Asked if she was aware of IS beheadings before going to Syria, she told Sky News: “I knew about those things and I was OK with it. Because, you know, I started becoming religious just before I left. Ms Begum said she escaped from Baghuz, Islamic State’s last stronghold in eastern Syria, two weeks ago. Her husband, a Dutch convert to Islam, is thought to have surrendered to a group of Syrian fighters. She told Sky News: “I was just a housewife for the entire four years. Meanwhile, debate continues over whether Ms Begum should be stopped from returning to the UK. Writing in the Sunday Times, Home Secretary Sajid Javid warned he would “not hesitate” to prevent the return of Britons who travelled to join IS. But the government does not have consular staff in Syria, and says it will not risk any lives to help Britons who have joined a banned terrorist group. If Ms Begum is able to reach a British consulate in a recognised country, it is thought security chiefs could “manage” her return. Cabinet minister Jeremy Wright told BBC’s Andrew Marr programme the new baby’s nationality was “not straightforward”. The former attorney general said: “In the end she will have to answer for her actions. US-backed Kurdish forces continue an assault on the last pocket of the Islamic State group’s territory, on the Syrian side of the Iraqi border. US President Donald Trump told the Western allies to take back and put on trial more than 800 IS fighters captured by the Kurdish-led forces. He said the IS caliphate was “ready to fall”. A former head of the British Army, Lord Dannatt, backed Mr Trump’s calls, saying Britain had a “responsibility” to those who left to join IS. Speaking to Sky’s Sophy Ridge on Sunday, he argued they should be treated “fairly and firmly”, adding “a bit of mercy” would help prevent others being radicalised. But he cautioned it was mistaken to believe IS was “100% defeated”.